US Made - Perfect Fit Guarantee - Ships Same Day Free! 2000+ Sold ! Men Stainless Steel Ring ! Good Quality !! 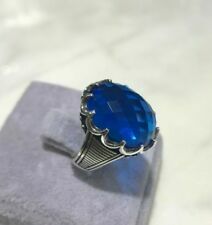 Whether you are searching for a men's ring suitable for everyday wear or a ring to exchange on your wedding day, sellers on eBay provide an amazing variety of options. Choose the materials and design that fits your budget, lifestyle, and fashion. Classic bands and modern, funky pieces are both terrific additions to any man's wardrobe. The best material for a men's ring varies based on your sense of aesthetics and activity level. Titanium and tungsten are both top alternatives for men who expect to expose their ring to a lot of wear and tear. Tungsten is scratchproof, ensuring that your ring looks fabulous for years. Titanium has a similar durability level, but provides the gleaming hue associated with white gold or steel bands, especially when you choose brushed titanium. For a classic look, gold is a popular choice that never goes out of style. Rose gold puts a vintage spin on the traditional gold ring. Men's rings are available in a plethora of styles. A solid band showcases the natural beauty of the ring's materials. For a bit of adornment, pick a ring that is decorated with diamonds. When your jewelry budget is tight, opt for realistic looking cubic zirconia adornments over real diamonds. Another possibility is a ring that incorporates a distinct hue or design into the ring's style. Celtic symbols and solid colors are both popular options that provide a handsome addition to any piece. If you are searching for a wedding band, you may want to match your ring to your future spouse's. An easy way to do this is to purchase a set of wedding bands. These bands feature a similar style, hue, and design. Individuals who have served in the military proudly display their service with military accessories, such as a ring that is decorated with the symbol and name of the branch that they served in. These rings often come with a stone; pick your birthstone or another stone that is meaningful.